This 1959 film was Hammer's third major monster movie, after The Curse of Frankenstein and the excellent Horror of Dracula. At only 60 minutes, this example must have been the shortest of their releases. That's not necessarily a bad thing; the script is short and to the point, and even caters for a flashback to the princess's pilgrimage, death and laying to rest. Some, however, may argue this particular scene is a little long, as it utilises a large percentage of the over-all running time. Christopher Lee (who else?) is seen as Kharis performing the rituals and sealing the tomb. It transpires that Kharis was in love with Ananka and secretly desecrates the tomb himself in an attempt to revive her using the Scroll of Life. For the crime he is bandaged-up and stuffed in a cupboard for all eternity, guarding her resting place and ready to punish other desecrators. Lee is simply superb as the mummy of the title, emerging from a bog after an accident in transportation, and staggering/lurching menacingly but unsteadily, obviously not used to this walking lark. His performance as the Mummy is very convincing, considering he never utters a single word (a little difficult, I should imagine, having had his tongue cut out). A marvelous acting performance, displaying certain emotions with only his eyes. The scene where he breaks into a cell in the sanatorium from outside has the appearance of being well-choreographed. It's quick and brutal. The camera stops short of showing the mummy get a leg-up the wall to the high window, which would have been so humorous I'd have paid good money to see it. I think this is the most convincing look and portrayal I've seen of a cinematic mummy. The Mummy/Mummy Returns of more recent years has no style in comparison. As I’ve watched this film several times over the years, and reviewed the last DVD release way back in 2004, let’s concentrate on the special features. This time around we get a three-disc release. As I was only sent the two DVDs for review, I can only comment on those. However, I do believe everything which is on the DVDs is also incorporated on a Blu-ray disc. On Disc 1 there is the original UK theatrical release of the film in the new aspect ratio of 1:66:1. There is an alternate full frame version with aspect ratio of 1:37:1. There is also a new commentary by Marcus Hearn and Jonathan Rigby, who are Hammer experts/historians. 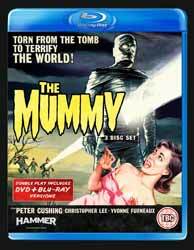 Disc 2 holds some very nice extras: Unwrapping the Mummy – The Making of a Hammer Classic, is an entertaining new documentary. The Hammer Rep Company, describes the bit players who returned time and again (my favourites are Patrick Troughton and the unsung hero Michael Ripper, who appeared in more than thirty Hammer flicks). The House of Horror: Memories of Bray is another new documentary following the rise and fall of Bray Studios (this is the extras highlight for me; 45 minutes, and the family atmosphere just shines through). The World of Hammer Episode: Hammer Stars – Peter Cushing (I love Cushing, but this is just a load of clips; buy the films instead). There is a stills gallery; an industry promo reel, restored to HD; and a ROM PDF booklet by Hammer archivist Robert J. E. Simpson.